Another Proctor and Gamble produced food has ANOTHER major recall for salmonella? Something is certainly up. After Natura’s 2 recalls, and 2 extensions within the past 5 months, if I were anyone who could investigate what is going on at their plants, or what they are bringing into their plants, I would put that tops on my list. Very upset about this latest recall. All my dogs eat Iams natural and I threw away the bag as I keep their food in a container. My one dog has Cushings and she is sensitive to foods. 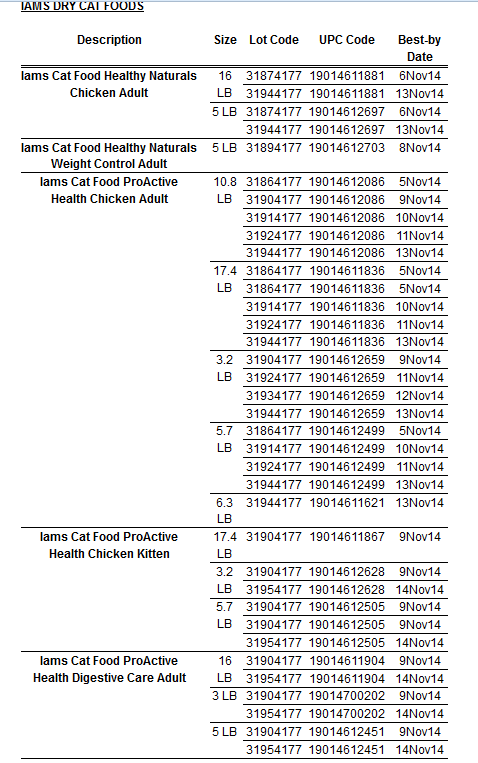 What is up with Iams ? I also put my cats food in a plastic container and throw out the bag. I just threw away 16 lbs of the Iams food I saw on the recall because I would rather lose the money than have my cats sick. It just makes me sick to my stomach to know they have been eating this food. I took them to the vet today and they said they are ok but to keep an eye on them. From now on I wont be buying anymore Iams for my cats and I will always keep that part of the bags to know the information in the future. 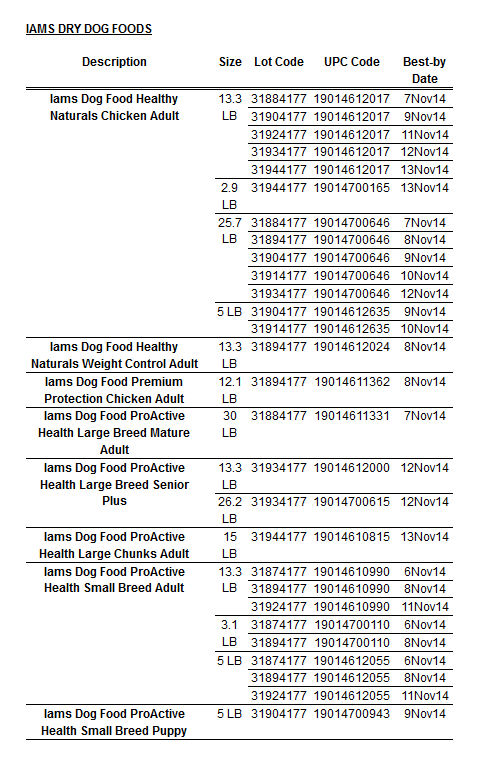 That is a lot of pet food to be recalled! Who is going to pay the vet bills for animals that are affected? Is Proctor & Gamble offering to? If not, they should be sued! Is this only in the US? 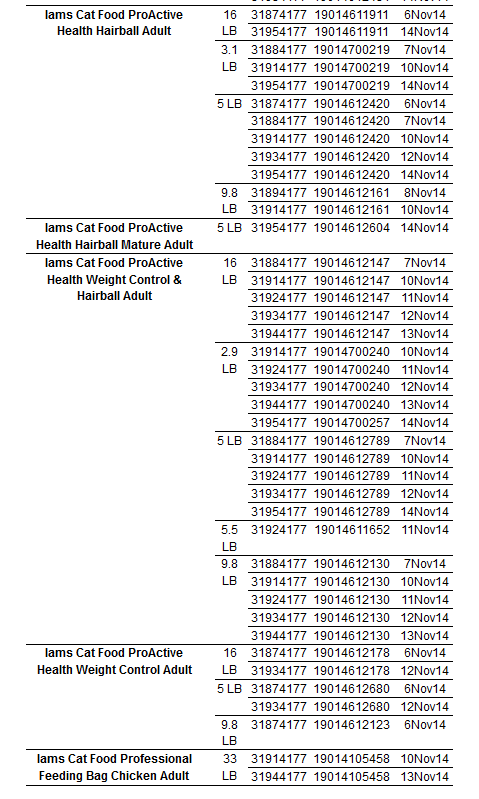 I know it says the product was distributed in the US but I’m just double checking, i feed my kitty Iams, I’m in Canada. Stay away from all P&G pet foods, that’s all I can say. I got caught twice in the recalls involving California Natural that my dogs ate and did well on. I’ve since changed foods for them. With all these problems, I will probably never go back to the P&G food. The UPC matches the recalled ones, but I can’t for the life of me find an expiration date or lot code. I’ve looked allllll over the bag. If the UPC matches, is that good enough to know it’s part of the recall? Nonsense? That is time “wasted” was your pets LIFE! I think we all regret the time pet owners “waste” worrying about commercial PF. Probably moreso than we worry about food intended for humans. It isn’t that our pets aren’t worth the extra vigilance, it’s that these huge mega conglomorates (P&G) waste OUR time doing the part of the job that THEY should be doing … namely quality control and safety before PF is ever released to the public!!! Such companies can certainly afford to do so, while we can not, when it comes to throwing out wasted food on which we spend our hard earned money!!!!!!!! We have a pet food manufacturing plant in our area. My daughter has spoken with some of their employees. There are certain rules in place about how and when the machines are supposed to be cleaned but apparently the employees often neglect to follow those rules. Of course one machine that is not cleaned at the proper time is a source of contamination to all the product that runs through it. I am aware of the fact that this happens frequently. I have to wonder just how much “food” has experienced this cross contamination but has not been caught by the company. I would never feed my pets mass produced food. Kibble it’s self is not a natural substance for animals to eat. The ingredients used are substandard, the product is highly processed. I think that pet food companies feel that since the ingredients are cooked at such high temperatures that it does not matter what they put in the mix. There is basically very little nutritional value to most pet foods. That is why they have so many synthetic vitamins tacked on the end of the ingredient list. Much like the highly processed breakfast food that the human food industry pawns off as nutritious. I found that by following veterinary advice, maintaining the pet’s records and paying for appropriate testing, Proctor and Gamble was willing to reimburse a pet owner for medical costs as a result of the Natura recall this past spring. Nonetheless, I am personally preparing my dogs’ meals and have purged my home of all P&G products. The emotional consequences that result from having a sick pet as a result of a company’s profit motive are unacceptable for some pet owners. I assume the affected pets do not appreciate the suffering either. Consequently, I have stopped patronizing the firm by not purchasing any other products related to the P&G conglomerate. P&G will realize very little profit from this consumer ever again. As for the folks who insist that a little salmonella is OK, that dogs in the wild consume infected carrion and all the other arguments that attempt to mitigate this new development as a passing non-event, save your arguments for somebody who doesn’t understand ethical conduct and the public health responsibility associated with producing food products. Thank you. I’ve been watching PF recalls for a long time. Except for 2007 and the CJT issues, recalls seldom make high visibility general news. But this is a first. A lead headline (top right first line) on Google, being reported by CBS News! 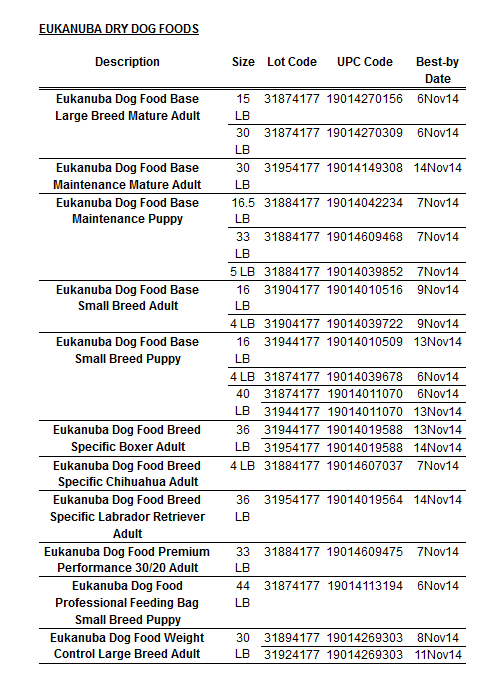 ( http://www.cbsnews.com/8301-204_162-57598733/some-lots-of-eukanuba-iams-dry-foods-for-cats-and-dogs-recalled/ ). This is utterly amazing for a P&G company to be getting such visible bad (or at least questionable) press. They must be cringing in the PR/Media relations department. Now if only the media would take notice of other messess, and move on to investigate even worse … do you think we’re making progress afterall? Now that P&G is getting mainstream news’ attention, can we get some of the vets who have been influenced by the corporate dollar to realize this product is not the be all and end all? We are so glad that we pulled out of all these brands when P&G took over. OMG – I took my cat to the vet 10 days ago for vomiting, hiding and lethargy. They took blood, and she had a fever. Blood showed low albumin and neutorphils (?). They gave her fluids, antibiotics and anti-inflammatory. They gave me Hills to feed her one week and she bounced back better than normal! I slowly introduced her regular IAMS back and a week later the vomiting started again! I have only had her for about 9 months and the prior owner said this IAMS is the only food she has ever eaten! Lo and Behold – I checked the bag and the lot – it is on the contaminated list. I called vet and my poor kitty has to go back for more tests. Tell me – what is the best food to give a 10 year old cat – either purchased food or homemade? WOW – I am so amazed at all of this. All I can say is STAY AWAY FROM NUTRO MAX!!! Talk about a pet food that kills. The numbers are in the 1,000’s now. Their massive Melamine poisoning in 2007 is just one example. It has now started all over again since Dec. 2013 with both dogs and cats dying and becoming violently ill after eating all different types of NM food and treats. Where is THIS recall?!? My cat died after 3 meals of their poison, and no one has done a thing. PetCo is still selling it although people have reported the incidents to them from all over the country. You cannot trust any of them. Wellness would be my best suggestion but you just never know. This is what I hate about PF companies. A recall such as the one in this article is announced. In the same notification (which is stupid to begin with) the same report also claims that no illnesses have been reported as a result (dumb) and that most pets would not be affected by Samonella anyway. Now who in the world would know that the adverse symptoms a pet is experiencing is due to a recalled PF (as opposed to it being an independent problem) UNTIL the issue could be cross referenced with the announcement! Yet, never is there any follow up that as a result of the same recall, any number of illnesses are being reported. Not by the FDA nor by the responsible company! And yet, reports like MEM’s are beginning to surface (and much to their surprise) perhaps as people Google the name of the PF in use! So companies never have to claim publically what’s really going on out there. And furthermore, if Samonella is supposedly such a non-issue for “most” pets, then how can it have such dire consequences for some?? My guess is that “Samnonella” is the umbrella reason that’s used to get certain lots and releases of PF off the market, for actual reasons well understood by the companies themselves. But as long as they reference “Samonella” which is probably present in many foods and releases already, they’re safely hiding behind the truth. This whole thing is repulsive. Feeding pets disgusting, low quality food is bad enough but then not even caring to help the victims of their contaminated “food” boarders on criminal. If not criminal it is morally repulsive! All they care to do is cover their trail of misdeeds while pet owners are having to deal with sick (or worse) pets. Hopefully this will open some folks’ eyes about the quality of food they give to their pets. I had my dogs on beneful for years. after the recall about beneful a few months ago, i took it and threw it all out. I havent heard any recalls about ceasar, or pet select, which is a refridgerated loaf and I switched to the pet select. or fresh pet. they have natural ingrediants, and if they have to be refrigerated, there must be little less of chemicals and preservatives. its like putting our food in the fridge, after a while it spoils. I won’t buy processed dry or can dog food again. Years ago, in the 50s we gave dogs table foods, and they lived forever! If it is good for me to eat, then my dog deserves the best! Maybe I missed this elsewhere on your website, but the P&G recalled items may be connected to cases of hemorrhagic gastroenteritis. This is so scary! No deaths? I feed weight control to my 15 y/o tabby. When he got sick I tried regular Iams. He did die on the 16th of Sept even after after fluids and care. I’m so outraged. I figured the food was poisoning him, but I switched food to late. I miss him like crazy and have cried for him every week since he died. I hate Iams, the murdered my old, beloved friend, my cat.